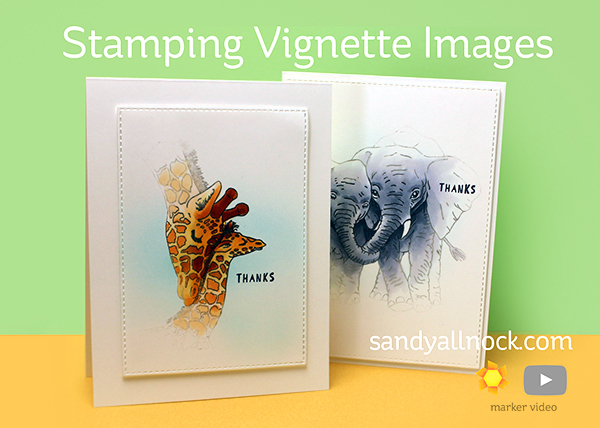 Some stamps just cry out to pull you innnnnnn to the tenderness of the scene, and both of these stamps do that. They have hard edges, and there IS a way to combat them and create a vignetted image – faded out at the edges – and accent that with vignette coloring as well! Watch the video below or click HERE to see it in HD on YouTube. Fantastic, we were taught this at college but like many things I forgot about it, so great refresher off you. Sandy, you are such a wonderful teacher! 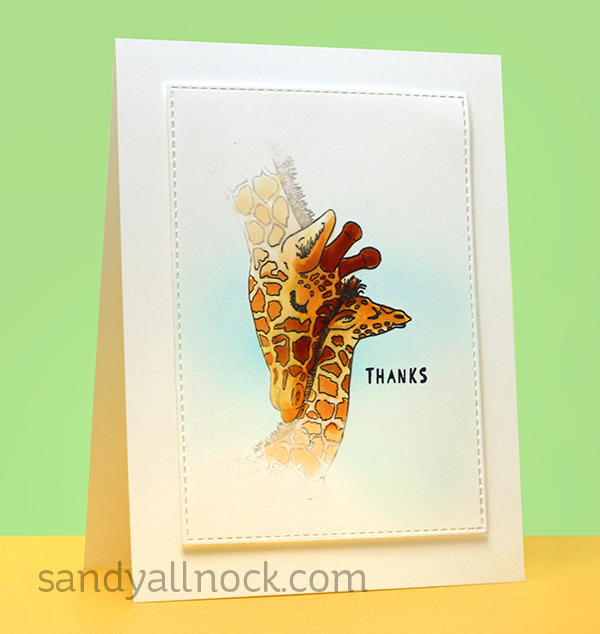 I always seem to come away from you blog having learned something new that I can apply to my own cardmaking. Using this fade out technique to draw attention to the emotion of the images is one of those “of course, I should know that!” kind of things – but I don’t until a teacher like you shows us “how to” use it in our own art. Thank you, Sister. Keep on using your God-given gifts for Him ! Giraffes are my all time favorite. Beautiful cards!!! Really beautiful cards (loved the video, too). I support an elephant charity and think they are magnificent. Wow Sandy, every thime when I think you can’t do better, you come with an other great piece of art! Thank you so much for these great cards and things you learned me again. You never cease to amaze me! These cards are just lovely. Coffee wakes up my brain – but you wake up my imagination! I’ve baby-wiped the outside edges of background stamps before, but never thought to do it with a central image. What a fun idea to try today!